Trevor and Travis Stuart were born and raised in rural, western North Carolina where the Blue Ridge and Great Smoky Mountains meet. Their hometown of Bethel (one of three in North Carolina) in Haywood County, hardly shows up on a map, but this region of greater Appalachia has long been known as a hot bed of traditional music. The twin brothers grew up immersed in this rich musical culture and have played together since early childhood, forming their first band in junior high school to play for local clogging teams and festivals. 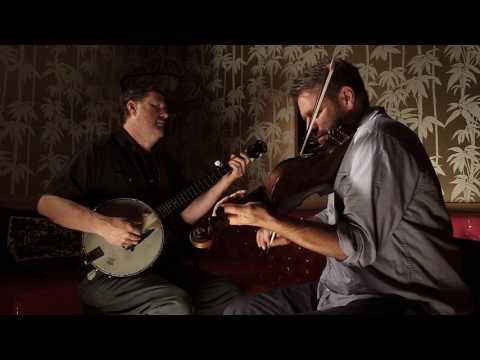 Both individually and together, the brothers have gone on to play worldwide and are especially known, and greatly admired for their tight fiddle-banjo duets. This CD/DVD release by the Old-Time Tiki Parlour is a testimony to their lifelong partnership. When Trevor Stuart passed away suddenly in March of 2016 at the age of 47, it sent shockwaves through the Old-Time music community. To quote Rayna Gellert in the liner notes: “This fact remains stark and painful and raw for all of us who love him.” It is incredibly fortunate for us that David Bragger invited the Stuart Brothers down to the Old-Time Tiki Parlour to record for a few hours one afternoon in May 2015 while they were in town for the Los Angeles Old-Time Social. The intent was to just capture a few pieces for posterity but as the afternoon progressed, the brothers recorded one piece after another and a few hours later, and generally in a single take, they had the makings of what has just been released as The Stuart Brothers CD & DVD release. To begin, remove your ear buds and play this on a proper stereo and for crying out loud, turn it up! The entire hour long CD and accompanying DVD is strictly fiddle and banjo in intricate, tightly woven duets. There is an understated quality to this but make no mistake, this is an important and magnificent record of the brothers at their peak. Trevor’s fiddle playing is subtle, soulful yet incredibly powerful and Travis' seemingly delicate clawhammer banjo back up is perpetually in the groove, propelling the duo forward. While perhaps not as well-known as a few earlier Tiki Parlour releases such as Bruce Molsky, the Stuart Brothers are highly regarded in the Old-Time community as “musicians’ musicians” and this new record is already being compared with the infamous fiddle & banjo duet recordings of seminal North Carolina musicians Tommy Jarrell and Fred Cockerham. While not locked into the role of being preservationists for their particular corner of Appalachia, the Stuart Brothers are most certainly champions of the regional traditional music of North Carolina. Most of this record features instrumental fiddle tunes from older North Carolina fiddlers augmented by some great Kentucky tunes courtesy of Bruce Greene and some great Tennessee repertoire from Arthur Smith and The Roan Mountain Hilltoppers. From the powerful solo fiddle opening of Polly Put the Kettle On to the “I’ve never heard them quite like this” standards; Mississippi Sawyer, Little Liza Poor Gal, Sally Ann and Durang’s Hornpipe, this is an Old-Time tour de force by any standard. A few personal favorites include the roaring modal Goodbye Girls, I’m Going to Boston; Trevor’s composition Henry King’s Reel, named for their great-grandfather, fiddler Henry King (1856-1914); and the closing Pretty Little Gal with a Blue Dress Own featuring the late Trevor singing the verses. The Stuart Brothers CD/DVD set also includes a 12 page, full color booklet with Stuart family photos and delightful illustrations by Old-Time artist Angelina Elise. In short, a wildly important addition to the modern canon of Old-Time music that is not to be missed. The Stuart Brothers marks the eight release from David Bragger’s & Rick Hocutt’s Old-Time TIki Parlour and available here. Visit Travis & Trevor Stuart website.